Lecithin - 1200 mg, 80 softgels each (Nature's Wonderland) - Penn Herb Co. Ltd.
Did you know that approximately 30% of your brain is composed of Lecithin? No wonder, it's the super food for memory and superior mental fitness. 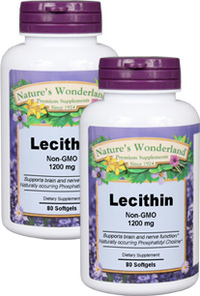 Each serving of Nature's Wonderland Lecithin -- from non-GMO soybeans --- gives you over 3,000 mg of Soy Lecithin! Supports healthy brain function; nervous systems support; supports cardiovascular health. Supports healthy liver and gallbladder function; promotes fat & cholesterol metabolism; promotes absorption and utilization of fat-soluble nutrients, including vitamins A, D & E.